While reading the recipe, I really liked the notion that Cook's Illustrated said there is no need to brown the short ribs on a stove top---now that statement really got me interested. The easy way out is for me. Yee Hah! 45 minutes on a roasting pan, or sheet pan with sides, at 450 degrees, those ribs were smelling good and they were nicely browned. They leaked out a lot of grease and a fair amount of delicious brown bits to add back to the braising liquid. While the ribs are roasting away, you can prep all of the veggies, raid your husband's wine stash (shhhh), take your snips out to the garden for the herbs and gather and assemble all of the other ingredients. The recipe is adapted from Cooks Illustrated. Mine differs in that I believe in using and eating the braising vegetables in the finished dish. CI suggested you make and garnish the finished dish with parsnips, pearl onions and bacon. This is not a hurry up dish, so allow at least three and a half hours. You won't be sorry! Side- note: Daughter Kelly and S-I-L, David like to add black lentils to the braising liquid. It would healthier than mashed potatoes or noodles to be sure! Maybe Kelly will post comments on how she alters the recipe. Preheat oven to 450 degrees, arrange the short ribs, bone side down,in roasting pan. Season with salt and pepper. Roast the ribs until nicely browned, about 45 minutes. Transfer ribs to a plate. Drain the fat into a small bowl, leaving the remaining browned bits in the pan . Reduce the oven heat to 300 degrees. Place the roasting pan on two stove top burners set at medium heat, add wine and bring to simmer, scraping up all of the browned bits with a wooden spoon. Set aside. Heat two tablespoons reserved fat in a large Dutch Oven over medium-high heat. 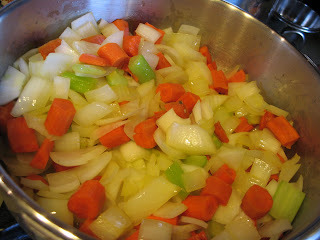 Add onions, celery and carrots. Cook, stirring occasionally, until vegetables are softened, about 12 minutes. Add garlic and cook until fragrant, about 30 seconds. Stir in flour until combined, about 45 seconds. Stir in the wine, broth, tomatoes, rosemary, thyme, bay leaves, tomato paste and salt and pepper to taste. 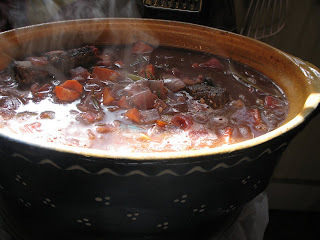 Bring to a boil and add short ribs, submerging them in the cooking liquid. Return to a boil. cover, place in the oven and simmer for 2-2 & 1/2 hours. Remove any accumulation of fat. Serve with mashed potatoes, couscous, noodles, or rice since you will want to sop up all of the braising liquid and vegetables.